Looking for a spirited spot to stay? Historic Hotels of America®, the official program of the National Trust for Historic Preservation for recognizing and celebrating the finest Historic Hotels, has just named the Top 25 Most Haunted Historic Hotels for 2018. ConventionSouth would like to give a shout-out to those properties located in the South. The Admiral Fell Inn is no stranger to ghost stories. Guests have often reported seeing floating sailors and disappearing butlers knocking on their doors. A hotel manager is also said to have heard a loud party after the hotel was evacuated during a hurricane. 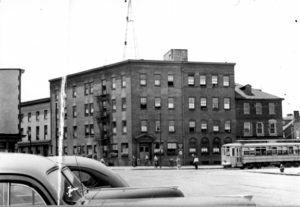 This comes as no surprise as parts of the building date back to the 1770s when it was a theater and boarding house where seamen, immigrants and “ladies of the night” would pass through. and hotel staff have experienced during this hotel’s long history. A maid, known as “Mrs. Clean” reportedly haunts the hotel. Paranormal researchers once asked why she stayed, and the maid, whose mother, grandmother and great-grandmother also worked at the hotel, said she was picking up after housekeeping to ensure high standards. 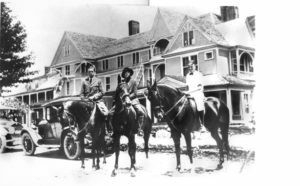 The Jekyll Island Club Resort has seen many families come and go since its founding in 1886. There have been seven reported ghosts that have been known to haunt this resort. They range from a ghostly bellman who delivers bridegrooms their pressed suits to the ghost of a former president who walks the veranda at sunset. Samuel Spencer- a club member who departed from this world under mysterious circumstances is said to haunt his old rooms early in the morning, sipping coffee and reading the morning newspaper. The Bellman, dressed in 1920s uniform with cap and suit is said to deliver freshly pressed suits to bridegrooms. More than one bridegroom, who had not ordered this service, have inquired about our ghostly bellman. Eddie Gould died tragically during a hunting accident at the Jekyll Island Club. 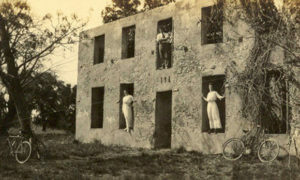 He loved coming to Jekyll Island and staying with his grandmother, Hester Shrady, who owned the cottage next door, Cherokee. It is said that his old room will mysteriously open at dusk and the faint smell of roses, the favorite scent of Eddie and his grandmother, lingers in the air. This 1891 hotel keeps a “Ghost Log” in the lobby for its guests to peruse (and add to when they have their own encounters to share). Pay attention to notes regarding Room 318, where Laura Green died. Laura was the daughter of the inn’s founding family and she was jilted at the altar. Reports are that she and her would-be groom continue to be seen on the third floor. One of Nashville’s most iconic landmarks, Union Station Hotel dates back to 1900 in a building that previously served as the city’s buzzing railway station. While the building’s past life is apparent in the hotel’s stunning preserved architecture—the soaring barrel-vaulted ceiling, 100-year-old stained glass and grand towers of the former train station’s main terminal are nothing short of breathtaking—every so often, guests are also reminded of the building’s rich history through another kind of encounter: with the hotel’s resident ghost, Abigail. Legend has it that during World War II a young woman, Abigail, said goodbye to her soldier on the Union Station train platform before he shipped off to France. When she arrived at that same spot to greet him on his return, she was instead met with word that he was killed in action. Distraught, Abigail threw herself in front of a passing locomotive far below. The forlorn spirit of Abigail, still looking for her lost love, can reportedly be seen wandering the main terminal and her presence felt in Room 711. Now known as the Abigail Room, guests can request to stay in the haunted suite, which is decorated unlike any other room in the hotel with antique furnishings, a four-poster bed and artwork inspired by her tale. Abigail’s story also lives on at the hotel’s bar and restaurant in the grand lobby, Carter’s—The Abigail cocktail is a signature libation made with local spirit Picker’s Vodka, St. Germain, grapefruit juice, lemon and bubbles. Legend says two lovers were to be married at the hotel in 1907, but the groom met an untimely death on his way to the wedding. His then distraught bride threw herself down the elevator shaft, falling 10 stories to her death. The bride is said to continue to haunt the halls of this historic hotel. 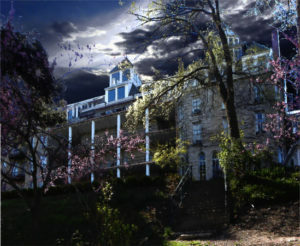 The historic Boone Tavern Hotel attracts ghost hunters by the score with its three-day ghost hunts, and some guests report seeing the apparition of a young boy in their photographs. In the hotel basement, the voice of a boy named Timmy can sometimes be heard. For nearly half a century there has been the belief that there is a ghost who roams the hallways of the main inn. She is referred to as the Pink Lady because of the flowing pink gown she wears. It is believed that this young woman was a guest in room 545 in the 1920s and that she either jumped or was pushed to her death in the Palm Court, five floors below. No records exist that support any of these claims, but it may have been hushed up to avoid negative publicity. Reports of her sightings still occur, some say they just see a pink mist, others a full apparition of a young long-haired beauty in a pink gown. This hotel, known as “the official hotel of the Alamo” is known to have ghosts haunt the halls. 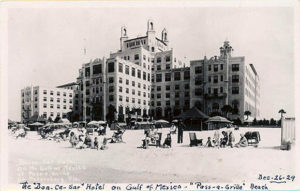 At one time, the hotel housed a medical facility, which had a morgue and a psychiatric ward on site. Reports of unexplained noises, apparitions, and the feeling of being touched have been reported by guests. Floors seven, nine, 11 and 12 are reported to have the most paranormal activity. Over the years there have been a number of reported “sightings” and strange occurrences at this historic hotel. Although there are various stories, the most common presence felt through the building is that of Mr. Thomas Rowe, the man who brought the Don CeSar to life and is the focal point of the love story surrounding the hotel. People have reported seeing Mr. Rowe throughout the hotel, on the beach, and even interacting with guests and staff. In the evening it has been reported that from time to time you can look up to the windows on the 5th floor and see the figure of a man just watching from above. 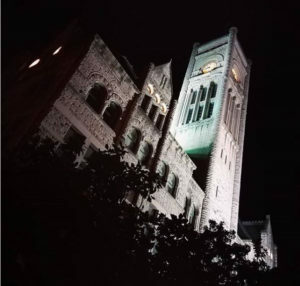 Over the course of its almost 90-year history, the Lord Baltimore Hotel has had reports of paranormal activity. 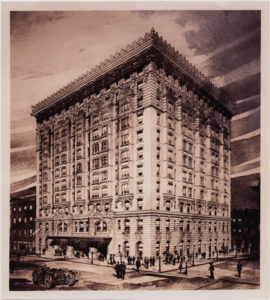 Built in 1928, the hotel was one of the tallest building in the city (the Great Fire of 1904 destroyed Downtown Baltimore) and around the time of the Great Depression, there were at least 20 documented reports of “jumpers” from the 19th floor rooftop deck. The most spoken about is that of a couple who attended an event at the hotel with their daughter – and then proceeded to jump off the building. Their daughter, “Molly,” is typically seen in the halls wearing a white dress and playing with a red ball. There has also been a lot of paranormal speculation around a handprint of a child on a wall in one of the hotel’s penthouses that won’t go away. During the Shoreham’s early years, three people died unexpectedly in suite 870. 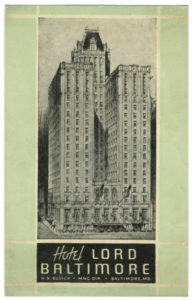 At that time the apartment was occupied by one of the hotel’s owners, Henry Doherty. Juliette Brown, the family’s housekeeper dropped dead mysteriously one night at 4 a.m. Doherty’s daughter and wife also perished mysteriously in the same suite. During its vacancy there were claims of mysterious noises, doors slamming shut and furniture moving—many of which happened around 4 a.m, the time of Juliette’s death.